SURREY — Tech talk is beginning to create a buzz at a hub in Surrey specifically developed for such activity. Health-technology companies that have made a home in what’s called the HealthTech Innovation HUB converged for a showcase event on Dec. 14. The noon-hour gathering brought together health-related enterprises that share space at Lark Group’s City Centre 1 building, on 96th Avenue near Surrey Memorial Hospital. The HUB’s second-floor space is filling with companies that share a passion for health technology. The semi-communal HUB includes companies such as Conquer Mobile, HealthTech Connex, Neuromotion, Breathtec Biomedical, Helius Medical Technologies and several others. City Centre 1 is the first of eight buildings planned in the immediate area by Lark Group, a development company that occupies the tower’s 15th floor. Across the street to the north, City Centre 2 is being built, and the top four floors will be occupied by Safe Software, currently located on 132nd Street in Newton. The software development firm’s 140-plus employees will move into 48,000 square feet of space at City Centre 2 in January 2018, said Don Murray, who with Dale Lutz co-founded Safe Software in 1993. “We’re excited about being there, because our current location isn’t conducive to transit, which is key in (attracting) young high-tech employees,” Murray said. Rowena Rizzotti’s job with Lark Group involves recruiting companies to be part of the HUB. Taylor Byrom’s fledgling Taylor Hart Designs, which makes and sells adaptive clothing for kids with special needs, is part of the HUB space occupied by Kwantlen Polytechnic University. “It’s a great place to learn and grow for a person like me who’s trying to get a new business off the ground, with so many health and technology people working here,” Byrom said. Collaboration in the HUB is a key element of the enterprise, Rizzotti said. “We create projects, we create prototypes, we create new technologies here and we work with the clinicians to help get them and validate them in the clinical environment, so they can quickly help people right away,” she said. Surrey, B.C. – Three students and one alumna from Kwantlen Polytechnic University (KPU) were recently recognized as members of Surrey’s Top 25 Under 25. Hosted annually by the Surrey Board of Trade, the Top 25 Under 25 Awards acknowledge business- and community-minded individuals under the age of 25 who are working in or contributing to the City of Surrey in a meaningful way. Among them are alumna Taylor Byrom, who launched her own design company out of the KPU Innovation space on Innovation Boulevard; soon-to-be alumna Sukhjiven Gill who, as an international student, is graduating at the top of her class and representing KPU internationally at business case competitions; entrepreneurial leadership student Saghi Ahmadi, who is successfully applying her education to real-world business solutions, and in her role as a lead trainer for MAC Marketing Solutions; and student Parabjot Kaur Singh, who volunteers with KPU’s Department of Languages and Cultures, serves on the board of the Punjabi Language Education Association and co-hosts a children’s radio show. Fashion meets social entrepreneurship. Taylor Byrom is the owner of Taylor Hart Designs, an adaptive clothing company developed for children with complex medical needs. Using special fabrics and designs, her clothing is designed to be functional for children with feeding tubes, tracheotomy tubes, wheelchair dependency and sensory processing disorders. A 2013 graduate from KPU’s fashion and technology degree program at the Wilson School of Design, Byrom embodies the essence of what KPU hopes for its graduates. As the first alumna to work out of the KPU Innovation space on Innovation Boulevard, she continually shows her ongoing spirit for giving back to her community, and alma mater. Byrom recently hosted her first Wilson School of Design student intern, was invited to speak at the school’s 2016 convocation ceremony, and will share her insights on her educational experience as a KPU Day panelist. Her vision, empathy and compassion for children with complex medical needs drives her to build a prosperous company based on integrity, innovation and human-centred design. A Langley fashion designer has come up with a solution to make clothes less uncomfortable and complicated for young girls ages two to five who have complex care needs. The Jolie Hart fashion line consists of clothes with features such as welt openings or special types of pockets that are less restrictive when wearers are in a wheelchair, have a sensory processing disorder or are attached to tubes for feeding or for supplying oxygen. “The clothing is still very wearable and very cute. The function that I put in is minimal but still very functional for these families,” designer Taylor Byrom told On the Coast host Stephen Quinn. Byrom launched this line as part of her graduation project at Kwantlen Polytechnic University. The idea came to her while volunteering with B.C. Children’s Hospital and then she started to put out surveys to families with complex-care-needs children to hear what kind of clothing would be less restrictive. She also had some people test out her clothes — such as one young girl who had a line from a special backpack attached to her abdomen all the time. “Whenever she wore a dress, [the line] would come out the hem and then hike up the hem of her dress,” she said. “It was incredible to hear that it actually did do what I wanted it to do, and it raised her wellness level and her self-esteem level,” Byrom said. Langley designer Taylor Byrom has created a line of children’s clothing for little girls with special medical needs. Using special fabrics and designs, the clothing is functional for children with feeding tubes, tracheotomy tubes, wheelchairs and sensory processing disorders. They may look like ordinary dresses, T-shirts and sweaters, but Taylor Byrom’s children’s clothing serves a much greater purpose. Using simple design altercations, Byrom’s first fashion line — Jolie Hart — is fully functional with feeding tubes, tracheotomy tubes, wheelchairs and sensory processing disorders. Created for girls ages 2 to 6, the soft fabrics, removable backs and button-up sides make dressing a child with complex medical needs one step easier. “I wanted to do something that was helpful,” the 24-year-old Langley designer said. Officially launched on Nov. 20, Byrom has worked with BC Children’s Hospital, the Feeding Tube Awareness Foundation, the Centre for Child Development at Surrey Memorial Hospital, Canuck Place and parent advisory groups to tailor her products to what her clients need. “When I did the research, it actually came back that boys were more needed,” Byrom said. “That was just heartbreaking to me, being such a girly girl. Originally, Byrom set out to be a designer for women’s wear. It’s a dream she’s had since taking home economic classes in high school, and a career path she was following until her last year of fashion design school at Kwantlen Polytechnic University. As a class requirement, she had to write a 10-page personal vision statement on who she was and what kind of designer she wanted to be. “I never thought I would do children’s clothing, I couldn’t understand why you would want to make something that you couldn’t wear,” Byrom said. Byrom says it was a “serendipitous moment,” as when she was writing the paper, she was also volunteering at miracle weekend for BC Children’s Hospital. That’s when it dawned on her that many of the children would benefit from specialized clothing. After months of research, she created Jolie Hart as her final collection at KPU in 2013. The clothing she sells now still use those original designs, with many improvements. Working out of Kwantlen’s design lab in Surrey, Byrom creates each item by hand. “I tried to design each piece to accommodate many needs,” she said. “I make sure to use as minimal seaming as possible, while still maintaining design, because that’s a big thing for me. For wheelchairs, Byrom has designed the backs to come off the jackets to reduce bulk while seated. The removable backs also work well with feeding tubes, which can slip out the side, she added. For sensory processing, Byrom uses soft fabrics and a heat press for information printed at the back of the neck. “A big issue is the tags at the back of the neck, which bother anyone, really, without sensory processing,” she said. Byrom is now working on her spring collection, which will feature new a raincoat, as requested by one of the parent’s in her advisory group. Her fall collection is available for purchase online on Etsy, here. For more on Byrom and Jolie Hart, visit her website taylorhartdesigns.com. Metro Vancouver, B.C. – Between medical appointments, feeding tubes, health exams or wheelchair navigation, managing complex medical needs at an early age can take the innocence and vibrancy out of childhood. Enter jolie hart, a new line by local designer Taylor Byrom. Not only does the line dance with playful prints and pretty designs, it works around the care needs of young girls ages two to five. “I wanted to develop a line of clothing that lets young girls dress for their personality, not their illness,” said Byrom, who first developed the clothing concept as a final-year fashion design student at Kwantlen Polytechnic University’s Wilson School of Design. From Langley to London, Byrom’s clothes have caught the attention of families around the world. And with jolie hart’s official launch this fall, the young Langley-based designer is now keeping busy at her workshop, located at KPU’s research and development space on Surrey’s Innovation Boulevard. “The launch of Taylor’s first clothing collection is a proud and defining moment for KPU and the Office of Research and Scholarship. It exemplifies our vision for the KPU Innovation space, which is to explore solutions to community health challenges and advance prototypes toward commercialization. There are a lot of people who will benefit from this type of specialized clothing,” said Arthur Fallick, associate vice-president, research at KPU. Moving forward, Fallick says KPU Innovation will be utilized by faculty and students currently exploring how to build dementia-friendly communities. The hub will also look at supporting other projects that, like Byrom’s, began at the Wilson School of Design. More information on KPU Innovation, as well as research and scholarship at KPU, can be found at kpu.ca/research. For details on Byrom and her line jolie hart, visit taylorhartdesigns.com. Langley, B.C. – When you start something new, you can’t be afraid to take chances. And what Taylor Byrom is starting is not only new, but life-changing for families around the world. Earlier this year, the Kwantlen Polytechnic University (KPU) graduate broke out on her own to break ground personally, professionally and fashionably with a line of clothing that accommodates the needs of young girls affected by complex care medical needs. This weekend, the Langley resident will showcase her designs along with two other KPU Wilson School of Design alumni at the 15th annual West Coast Women’s Show, hosted at the Abbotsford Tradex Oct. 16-18. “I wanted to design something with a purpose. I honed that idea while at KPU. My purpose here is to create fabulous, fun clothes for girls who just want to be young girls, despite the complex medical struggles they face,” said Byrom. From Langley to London, families around the world have shown interest in Byrom’s line, jolie hart. Her fall launch collection features garments that accommodate wheelchair dependency, sensory processing disorders and feeding tubes. “At the Wilson School of Design, we encourage and support our students and graduates to pursue opportunities that affect positive change through such avenues as sustainability, ethical business practices and solving problems through apparel solutions. Taylor’s collection concepts represent many of the these shared core values and we are proud to have her as an ambassador of our program,” said KPU’s fashion design and technology program coordinator, Andhra Goundrey. Byrom’s life-changing designs can be seen on the West Coast Women’s Show main stage, sponsored by Guildford Town Centre, Oct. 16 at 6:30 p.m., Oct. 17 at 6:00 p.m. and Oct. 18 at 3 p.m.
For more on the KPU Wilson School of Design, visit kpu.ca/design, or follow them on Facebook and Instagram. Information about the West Coast Women’s Show is available at westcoastwomen.net. Angela Robert manipulates on-screen ‘hands’ in an operating room. A surgeon turns from his patient in the midst of his procedure, and waves his hands through a blue beam of light beside him. The motion triggers a series of menus, allowing the doctor to manipulate real time images, providing a 3D look at the catheter being placed near the lung. The imaging diagnostics, known as Picture Archiving and Communication System (PACS) isn’t new. It’s the space-age way the surgeon is manipulating them without touching a thing. The Touchless Interaction with PACS System saves surgical time in scrubbing up and reduces the chance of infection, according to Nishant Uniyal, software designer for NZ Technologies, which created the device. The technology will likely be featured in surgical rooms for clinical testing at Vancouver Hospital in the next year or so, Uniyal says. It was unveiled at the opening of Surrey’s Health Tech Innovation Hub, designed to link medical technologies with local universities, the private sector and Surrey Memorial Hospital. There are currently 43 companies at the City Centre building, according to CEO Dianne Watts. She also says there’s a sizable waiting list for space at the hub. Next door to the touchless imaging system is the Hub’s Artificial Intelligence room. There, Conquer Mobile’s CTO (Chief Technology Officer) Aaron Hilton uses an iPad to create a 3-D scan of a person’s head. The scan works for any part of the body, is measurement perfect, and will be used to create ideal fitting prosthetic limbs. Imagine, Hilton said, being able to scan someone, and instantly have that image available to a 3-D scanner which will actually create the limb . He said it will cut down the cost and time involved in obtaining prosthetic limbs. Conquer CEO, Angela Robert, works with a headset which creates a real operating room feel. The headset will be used to train surgical staff how and when to hand the correct instruments to doctors. Called PeriopSim, the headset simulates real surgical conditions, and hones the speed at which correct instruments are provided to doctors. The key to being great at it is handing surgical equipment before the surgeon has to ask for it, Robert said. The hub was abuzz on Thursday during its grand opening, where several groups where showcasing their health industry gear. There was a company that created a wheelchair with airbags in case it tipped, saving the person in it from serious injury. Kwantlen Polytechnic University alumna Jolie Hart had playful clothing designed for girls with medical challenges. On display was an orange top, with pre-made holes to accommodate any medical tubing a youngster might need. The Health Tech Innovation Hub is part of the city’s vision of Innovation Boulevard, a connection between local universities, the private sector and Surrey Memorial Hospital. It is located at 13737 96 Ave.
What are your primary responsibilities at your job: Computer design, tracking current trends, creating tech packages for our factory partners and managing the inventory of samples for the east and west coast. What is your favourite part of your job? I love creating and manipulating prints and graphics; it’s always a challenge and keeps each season different. How do you like to unwind/handle stress? I love to watch movies — pop in a DVD of a popular series and I’ll watch the whole disc! I always have music playing on the iPhone and hanging out with friends and family tops the list. Who is the most famous person you’ve ever met? 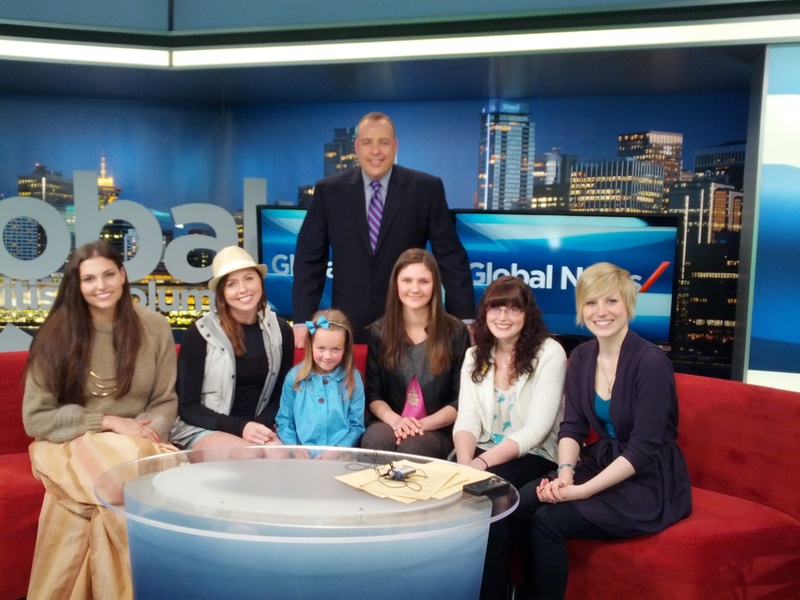 I was interviewed by Steve Darling on Global BC Morning News! If you had a time machine and could have lunch with anyone living or dead, who would it be? My Nana — she was my number-one fan. She didn’t get to see me graduate but I know she’d be very proud of my journey, the past and for what’s still to come. Where does your inspiration come from? I’m inspired by people’s stories. During my volunteer experiences with BC Children’s Hospital, you hear stories of hope and courage. Rosie, a toddler who is tube-fed, was one child who compelled me to look at fashion differently. Fashion should have a purpose; to be beautiful as well as meaningful in someone’s life. Where do you see yourself in one, five or 10 years? Jolie Hart, my own line of clothing for little girls like with complex care needs, will launch! What are you most proud of? I am proud of Jolie Hart and the impact it has had. Jolie Hart is not only about designing and creating fashionable clothing that meets the specific care needs of little girls; it’s as much about raising awareness that all children and families should be able to access clothing that is functional for complex needs. Parents shouldn’t have to use scissors to cut an opening in a shirt for a tube. We can do that – Jolie Hart does that. Greatest advice for life? Wow, I’m just starting so for me it’s all about looking forward and being open to new experiences. Take every opportunity that comes your way— don’t be afraid to put yourself outside of your comfort zone. Favourite Kwantlen moment? Who in fashion design wouldn’t say The Show! The Show is the exclamation mark at the end of our four years of hard work and accomplishment. What’s the last book you read? The Night Circus by Erin Morgenstern. What’s currently on your iPod? Tegan and Sara, Taylor Swift, Pink, Phillip Phillips; it’s all rather varied. Little girls want to be pretty, fun and special. Special for who they are, not for a medical condition. Through her volunteer work, fourth year Kwantlen Polytechnic University Fashion Design student Taylor Byrom found a deeper empathy for the children and families dealing with complex care needs. Her recognition of the unique needs of certain kids led to the creation of Jolie Hart, an adaptive clothing line named after her grandmother, specifically for girls aged two to six. It’s obviously something parents are interested in as the line hasn’t even launched and Byrom has already received a request on her site for similarly functional clothing for older girls. The Kwantlen Polytechnic University’s fashion design program will have its graduate fashion show on April 17 at the River Rock Show Theatre. Byrom will be one of the 35 students to show their designs on the runway. What started as designing clothes for paper dolls grew into learning to sew and a love of fashion. Now, preparing to graduate, Byrom is combining function and wellness into her whimsical clothing designs. Little girls experiencing sensory disorders, wheelchair dependency or the need for feeding or tracheotomy tubes are part of what the Jolie Hart line accommodates. Through the use of hidden openings and special plackets, tubes are easily managed. Breathable organic cottons, the ability to widen necklines and no tags ensures comfort with the clothing even when the situation may be far from comfortable. The Fall 2013 line includes 15 pieces in dresses, tops and jackets. To find out more about the fashion show, visit www.kwantlen.ca/theshow.